Believe it or not … this is actually a delicate, white fish (hake) and not a badly burnt chop as the picture might imply. We blame a wonderfully rich and dark soy sauce (yum scrum) but if you use a lighter soy sauce like Kikkoman it may be more pleasing to the eye! We made this because we haven’t had proper fish (ie. not shellfish) for a while and we’re trying to cook healthily for a few days before Christmas takes over. Heat the oven to 200C/fan 180C/gas 6. Melt the butter in a little pan, then stir in the soy sauce, lime zest and chilli. Tip this into a shallow (non-metallic) dish and add the fish, splashing it well in the marinade. Set aside for about 10 minutes. Take the fish out of the marinade and put it on a baking tray. 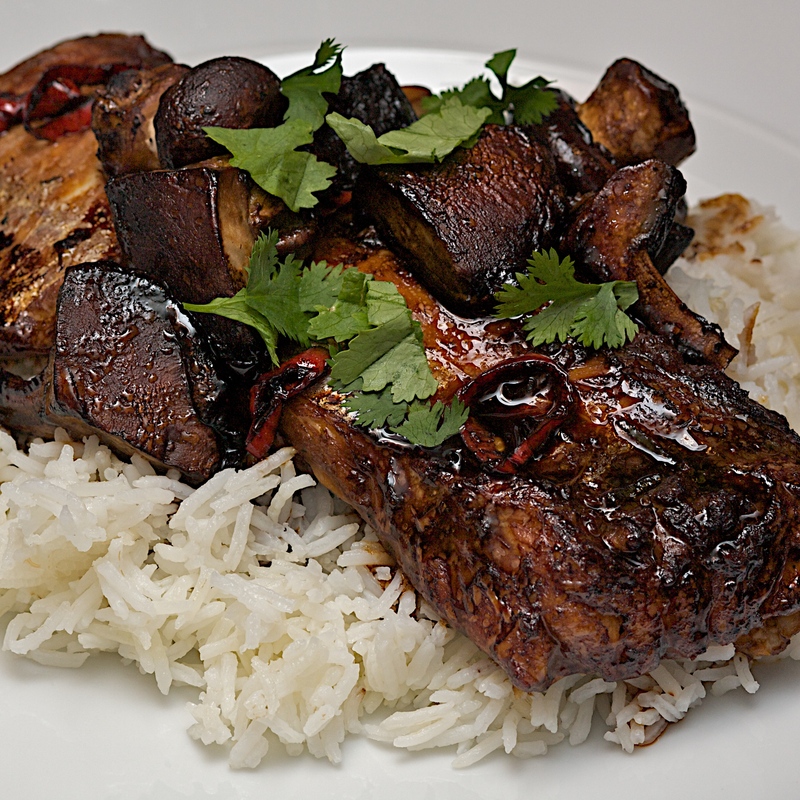 Toss the mushrooms in the marinade and scatter them around the fish, drizzling the rest of the marinade over the top. Roast for 6-8 minutes, until the fish is cooked and the mushrooms are sizzling. Scatter with coriander and serve with rice or noodles. (Original recipe from Ainsley Harriot – not someone we often cook from). Combine 300ml long-grain/basmati rice with 500ml water. Add 10g butter and bring to the boil. Cover tightly (we use tinfoil and a lid), turn heat to very very low, and leave it be for 25 minutes. Turn off the heat and let it rest for 5 minutes. Fluff with a fork and serve. Perfectly cooked rice! After a long day … made even longer by cold weather and snow delays … a simple and tasty soup that is all about freshness and flavour. 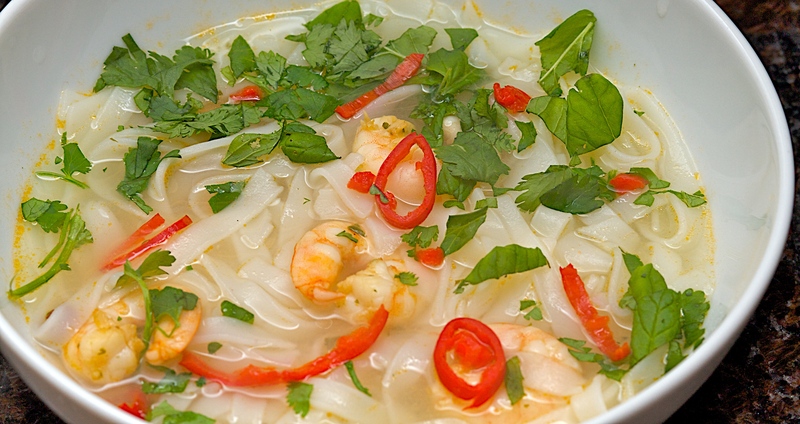 Boil 85g thick rice noodles for about 6 minutes or until al dente, then drain. Put 500ml hot chicken or vegetable stock in a pan with a tsp of fish sauce, the juice of 1/2 a lime, a star anise & a pinch of sugar. Bring to the boil and add the noodles and a handful of small raw prawns. Warm through, then pour into a bowl and top with a handful of mint and coriander leave and some chopped red chilli. (We don’t like talking about calories too much but this is only about 250 calories a bowl and has no saturated fat – we felt very good (and full) after eating it). Click here for original recipe on BBC Good Food.